Product prices and availability are accurate as of 2019-03-19 10:03:56 EDT and are subject to change. Any price and availability information displayed on http://www.amazon.com/ at the time of purchase will apply to the purchase of this product. The very large, firm, burgundy red fruits have thick red flesh and red juice. Their unique sweet flavor and high sugar content makes them exceptionally delicious for fresh eating, desserts and home wine-making. 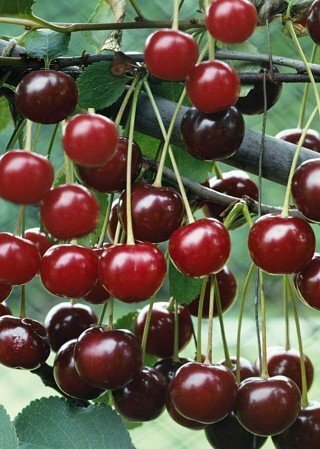 Ripening early to mid-July, the cherries store well, keeping for days at room temperature. Trees are self-fertile and grow 10 to 15 ft tall. Grows in zones: 3 - 9.